Edible mushroom cultivation can be a great winter project for the off-season gardener as the cool, moist conditions of late winter provide the perfect habitat for our fungal friends. Short days, damp weather, and human impatience are no problem—mushrooms need minimal light, and they can go from sawdust to sauté in a matter of weeks. Mushrooms as we know them belong to one of two phyla within the kingdom Fungi: Basidiomycota and Ascomycota. The mushroom itself is actually the fruit, or reproductive body (like an apple), while the vegetative parts, mycelia (that white webbing sometimes seen in healthy garden soil), live beneath the surface year-round. We rarely see mushroom mycelia, yet they form vast underground networks integral to our forest and garden ecosystems. Saphrophytic fungi are super-efficient composters that play an important role in the decomposition of lignin and coarse woody debris. Mycorrhizal fungi form symbiotic relationships with trees and herbaceous plants, helping them absorb more nutrients from the soil. Traditionally, mushrooms are autumnal fare; their wild season in the Northeast begins around Labor Day and ends sometime around Thanksgiving (tasty exceptions include king boletes, Boletus edulis, in June and the elusive morel, Morchella esculenta, in May). The trick of the mushroom grower is to create an ideal environment for mycelia to establish, mimicking nature in order to coax the mushrooms into fruit. Can you do this in your apartment? Sure, although first-timers would do well to invest in a mushroom kit, basically a brick of sterilized sawdust that has already been colonized by mushroom mycelia. You can order kits online from a number of reputable sources, or you may be able to find them at a local farmers’ market (many farmers are now making and selling kits). Unfortunately, mycologists have yet to discover a mushroom adapted to steam heat, so consider keeping your mushrooms near an open bathroom window or in the coolest corner of the apartment. Moisture is important. Your kit will come with a “humidity tent” (a plastic bag with holes in it that your block of sawdust will wear like a hat), but to create optimum fruiting conditions you’ll also need to spray your mushrooms three or more times a day. If you are rarely home, consider keeping your kit at work (this is easier in some professions than others), or placing it next to a humidifier. You will boost your chances of success by choosing a mushroom well adapted to the environment you have to offer. The pink oyster (Pleurotus djamor) mushroom is a tropical cousin of the blue oyster (Pleurotus ostreatus var. columbinus)—both have a mild, fragrant shellfish flavor, yet pink oysters will fruit at temperatures up to 85°F, while blue oysters can withstand freezing but will not fruit over 55°F. Sweet, meaty shiitakes (Lentinula edodes) are the most forgiving for new cultivators. If you’re feeling adventurous, try creating growing media from scratch (with sterilized barley, straw, or brewing waste) for more choice of varieties and scale. You can also go the outdoor route by inoculating fresh-cut logs with plugs of mushroom spawn, or mixing inoculated sawdust (along with some unfinished compost) into your garden beds, which simultaneously gives a natural boost to your plants (Stropharia rugosoannulata, the ”garden giant,“ is a good mushroom for this). Can’t get enough? Paul Stamet’s book Cultivating Gourmet and Medicinal Mushrooms is a must-have for any serious mushroom grower, and a mushroom club like the New York Mycological Society (newyorkmyc.org) is a great way to meet other urban mycophiles and learn to ID fungi from experts while exploring the five boroughs and beyond. Preheat oven to 375°F. Place bread cubes on a baking tray and toast in the oven; when golden, remove the bread and increase the oven temperature to 425°F. On the stovetop, sauté half the garlic in 1 tablespoon butter and 1 tablespoon olive oil. Remove from heat and toss the toasted bread with the garlic mixture. Set aside. Sauté the shiitakes with the remaining garlic, butter, and olive oil, keeping the pan covered to retain the juices, for 3 to 5 minutes, then add the oyster mushrooms and cook until tender. Place the bread in a 9-inch baking pan, then add the tofu cream cheese in small dollops over it. Spread mushrooms evenly over the bread and cheese. Beat the eggs with the milk, and mix in salt, pepper, and rosemary. Pour evenly over the contents of the pan and bake for 25 to 30 minutes, or until the edges are golden brown. Makes 2 to 4 servings. Lis Thomas is a former outreach assistant for Brooklyn Botanic Garden's community greening program. She has a BA from Barnard College and a BBG Certificate in Horticulture. 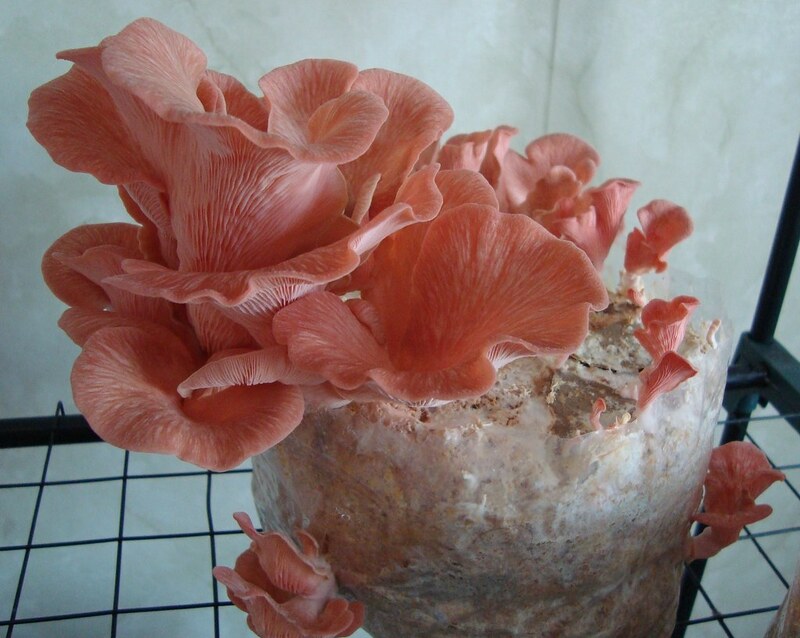 Pleurotus djamor (pink oyster mushroom) grown from a kit. Photo by Gerly123. 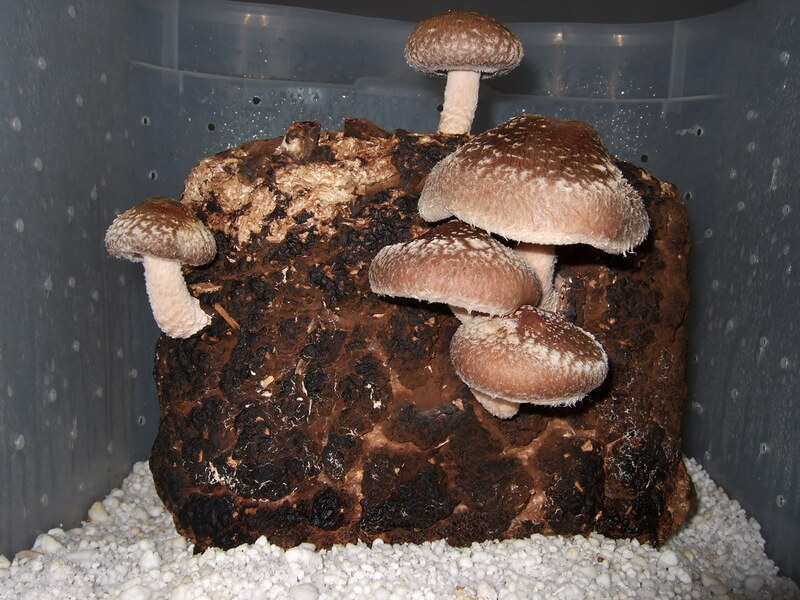 Lentinula edodes (shiitake) cultivation kit. Photo by Frankenstoen. 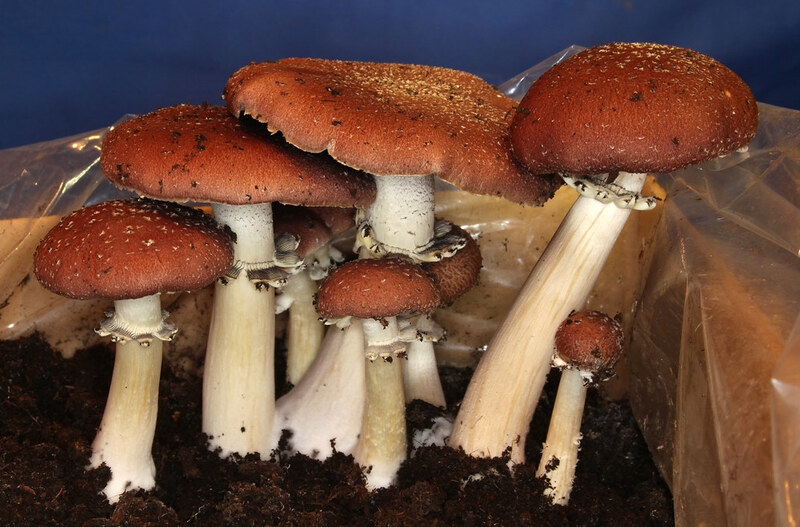 Stropharia rugosoannulata (garden giant) mushrooms can be successfully cultivated in your garden. Photo by Holger Krisp.